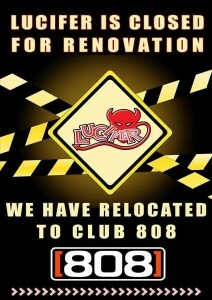 Lucifer is closed for renovation. It’s been an interesting week in the fair town of Pattaya with tumbleweed sweeping down walking st and the few remaining tourists wandering aimlessly with cameras set to record making the Soi more like gawking st ! One of the big changes has been the relocation of the Lucifer band, Gravity Seven. Without going into the politics of the Lucifer Close down ( which has been documented in the press), the team down there are using this dark cloud as a silver lining opportunity to renovate the lack-lustre fittings and give their new club 808 a well-needed boost by building a stage area and getting some live entertainment going. Flirt Pattaya were sceptical at first that the Lucifer prices would follow the band and we’d be going to the ATM frequently but how wrong we were. The San Miguel Light bottles remain at 75Baht all night and their 3 bottles for 3k stays intact. So lets get this straight….we can have a great nightclub night out with top Djs, plush fittings with air-con mixed with one of the top bands in town and down a cold beer for 75 baht with the only downside being having to negotiate an escalator ????? 808 also have their very own in-house photographer roaming the joint at the weekends so get a pic and check their Facebook page to remind yourself of what a great night you had.